Everybody needs the essentials! That’s what you get in this powerful, entertaining DVD series from Focus on the Family. Hosted by popular counselor and author Greg Smalley, the Essentials of Marriage series brings top relationship experts into your home or church—with practical wisdom, honest confessions, and decades of experience. 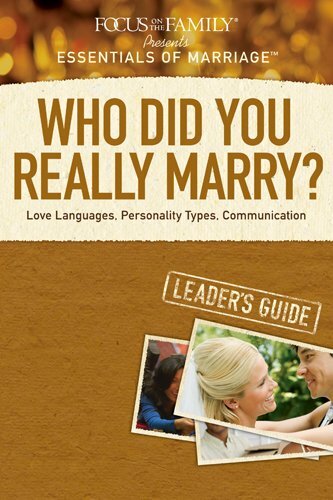 Essentials of Marriage: Who Did You Really Marry? shows how even opposites can get along, communicate, and resolve disagreements. Gary Chapman explains the five love languages that bring couples closer. With insights from Les and Leslie Parrott, John Trent, and more, you and your spouse or group will discover how two very different people can “become one” as God intended. Manufacturer: Tyndale House Publishers, Inc. Studio: Tyndale House Publishers, Inc. Brand: Tyndale House Publishers, Inc. If you have any questions about this product by Tyndale House Publishers, Inc., contact us by completing and submitting the form below. If you are looking for a specif part number, please include it with your message.